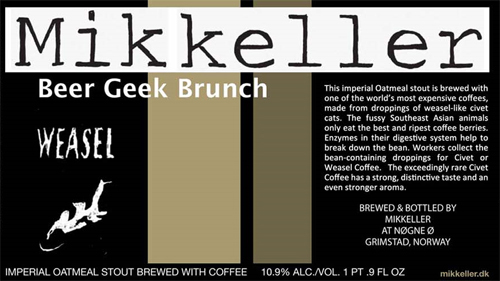 BEER GEEK BRUNCH WEASEL is an Imperial Stout from Denmark’s Mikkeller Brewery. Part of their “Beer Geek” series, Weasel uses Kopi Luwak coffee beans (widely regarded as the best and most expensive coffee in the world) to add an extra dimension to this beer. Beer Geek Brunch Weasel clocks in with a beefy 10.9% ABV.